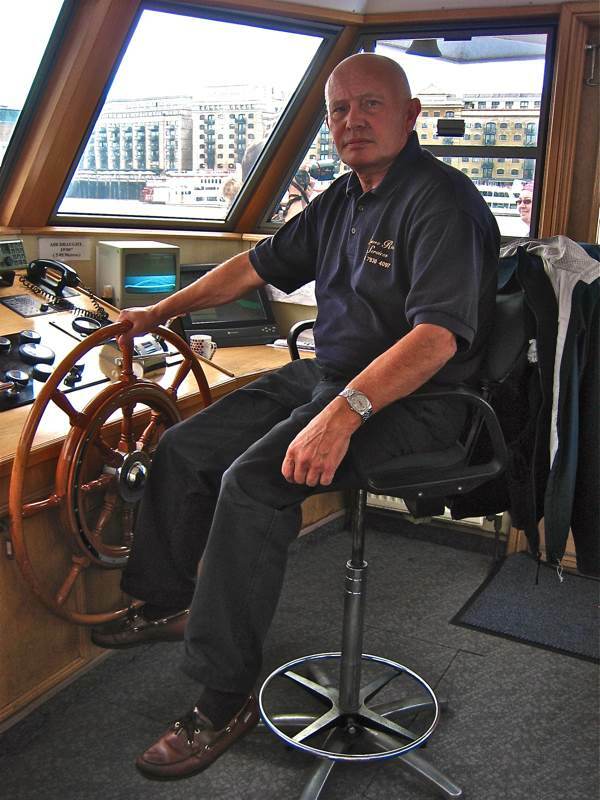 Bobby Prentice, Waterman & Lighterman, is a well respected personality along the river. 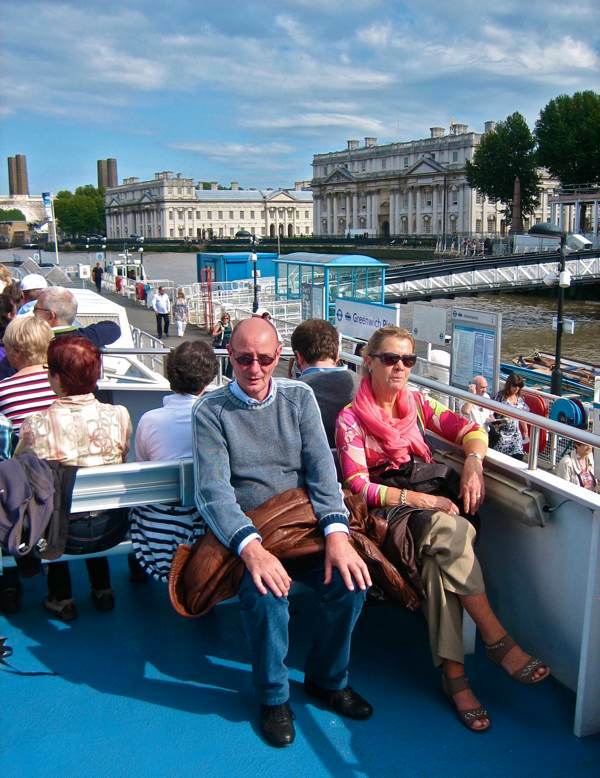 Today he is the skipper of a pleasure boat ferrying tourists between Hungerford Bridge and Greenwich, but his relationship with the Thames is lifelong and profound. Bobby holds the record for the Doggett’s Coat & Badge Race, is one of the Vintner’s Company Swan Upping Team, and his legendary prowess as a rower even includes successive attempts to row the Atlantic Ocean. Amiable and possessing a striking natural gravity, there is no doubt that Bobby is a hardy soul. 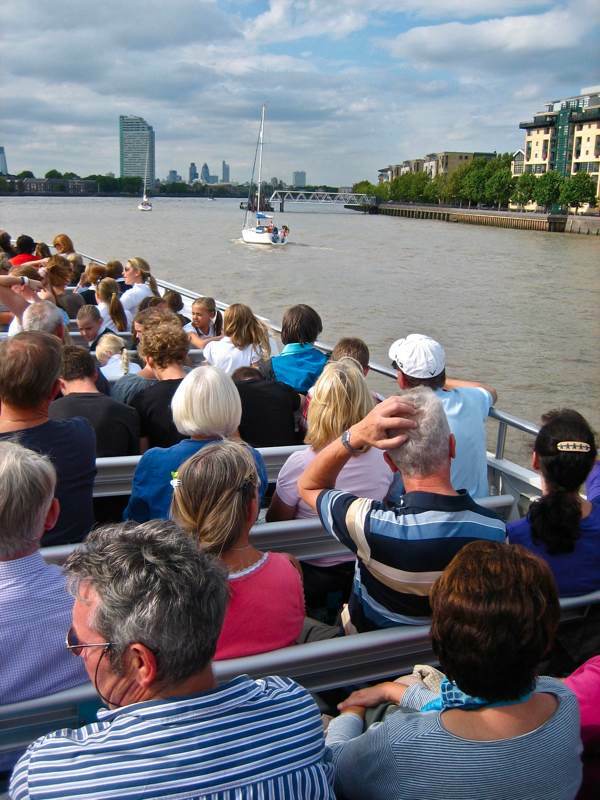 Originally, Watermen were those who took passengers across the river, and today it is necessary to win your Doggett’s Coat and Badge – in the annual race held each June – to be able to call yourself a true Waterman. In a critical distinction, Lightermen were those who transported goods, lightening the load of cargo vessels with their barges which were called “Lighters.” Both professions are of ancient origin upon the Thames and, in his career, Bobby has been both a Waterman & a Lighterman. 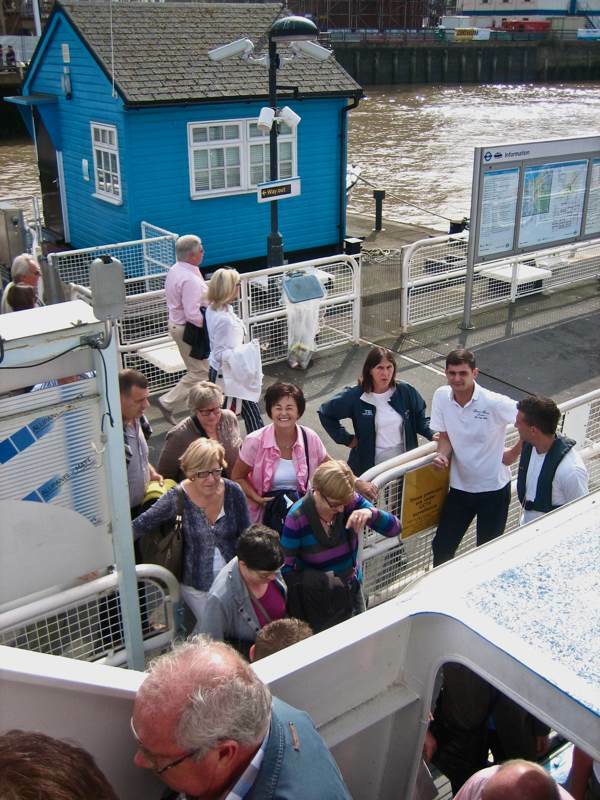 On a sparkling September afternoon, I joined Bobby and his son Robert in the cabin of the Sarpenden and – as we slid down river from Hungerford Bridge along King’s Reach and through the Pool of London, passing under Tower Bridge – he outlined his relationship with this powerful watercourse that defines our city. I was born and bred in Wapping, all my family come from Wapping. In 1969, at the age of sixteen, I was apprenticed to my father Robert. His father Robert was a Lighterman before him and his father Robert before that, which makes me the fourth as far as we know – there may well have been other Robert Prentices before – and my son Robert is also a Lighterman. We worked for the Mercantile Lighterage Co and in those days Fords at Dagenham did a lot of manufacturing, and we used to deliver knocked down kit ( that’s all the parts to assemble a car) to West India Dock, London Docks, Royal Albert Docks, Victoria Docks, Tilbury Docks and to Sheerness on the Medway for export. I chose to do it, but my father didn’t want me to because the docks were already closing. When I wanted to leave school at fifteen, he encouraged me to stay on a year to get my exams. But I loved every minute of being on the river. I joined Poplar & Blackwall Rowing Club at ten and I spent all my youth on the river. I had the river in me. I used to go and work with my father as a little boy, just as children do today – I often have my grandchildren on the boat with me. I did a five year apprenticeship, and a lot of Watermen & Lightermen still apprentice their children for five years, even though you can get a boat driver’s licence in two. My grandfather bought me my first sculling boat for £100 in 1968 and I won the Junior International Championship in 1970 and 1971, and represented Britain in the Youth World Championships. I won the Doggett’s Coat & Badge in 1973, then the double sculls at Henley with Martin Spencer, and subsequently Martin & I won three Home Internationals for England and two National Championships. 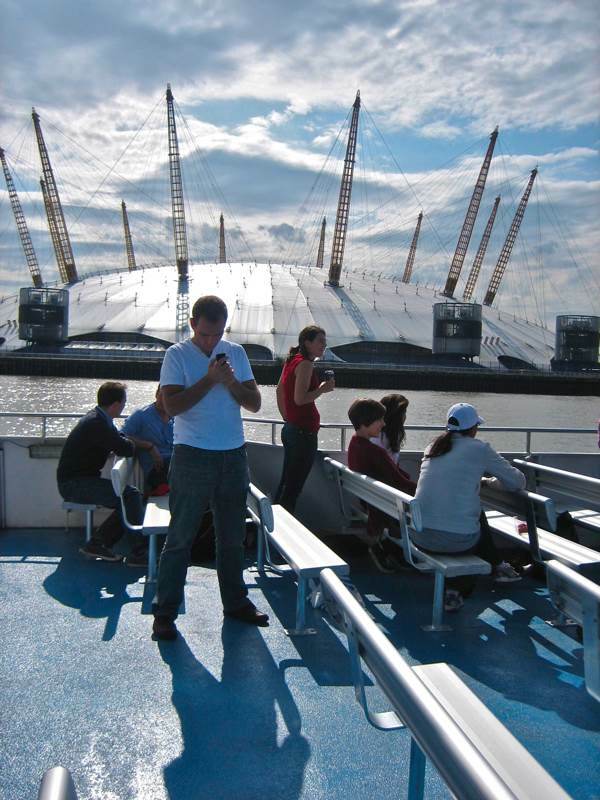 When I finished my apprenticeship, I spent my first two years in West India Dock. Once I got my licence, it enabled me to tow barges behind tugs and much more. I was one of the “jazz hands,” which is like being a journeyman. At twenty-two I got moved down to Grays in Essex and became a Tug Skipper, but in 1982 the Mercantile Lighterage Co folded as a consequence of the decline of the docks. The only lighterage left now is “rough goods’ – London’s waste, and my youngest son does that – towing the barges down to Mucky Flats and Pitsea Creek. This current business, Crown River Cruises, started in 1986, we began with one boat and we’ve got five now, and we do scheduled services. I still row. 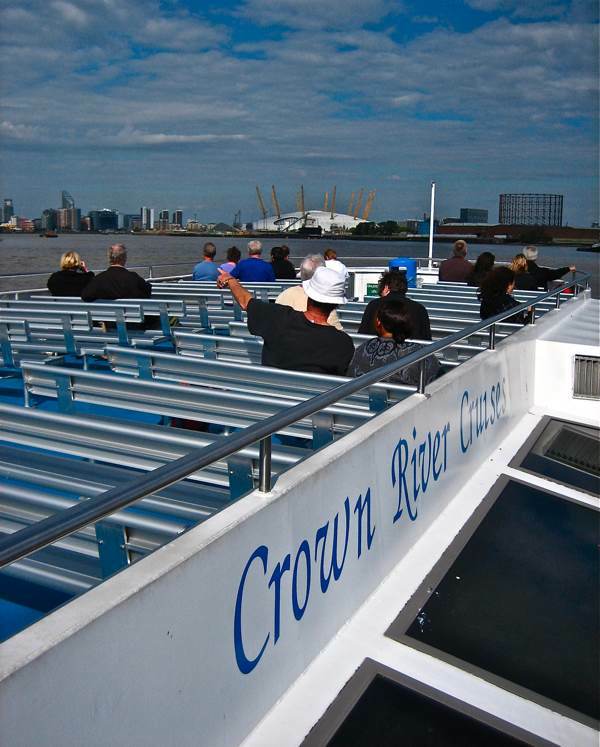 Yet no-one who works on the Thames can ultimately resist the tidal pull of that great expanse of water beyond and in Bobby Prentice’s case this attraction led him to try to cross the Atlantic in a rowing boat. Like most nutty things I’ve done it started in a pub. We’d been to a Doggett’s function and one of the lads suggesting rowing the Atlantic and I said , “No, I’ve finished serious rowing.” But then I went for a walk along Hadrian’s Wall and came back, and I decided to do it. We entered the Atlantic Race in 2005 from Gomera in the Canary Islands to Antigua and we set off a fortnight before Christmas in bad weather. It was hard mentally, but I made an agreement with my wife that I’d call her every Sunday at six on the satellite phone and I looked forward to it. After seven weeks rowing, it became a lottery who was going to capsize next – “bombing” we call it. The boat was so small, you’re literally living in a coffin. Then, early one morning, we bombed out and spent forty-nine hours in a life raft. My wife handled it very well when they called to say I was “lost” - “He’s done that before,” she said, “He’ll be back.” When I was in the life raft I’d just had my weekly call and the satellite phone was at the bottom of the ocean. They didn’t know where we were and the beacon we had was faulty, we didn’t know if it worked. I was lying in the raft and my elbow blistered from trying to hold the beacon up the satellite. I was trying not to sleep because of the hypothermia and hoping someone had picked up my signal, which only gave a seven mile vicinity of my position. We were picked up by 160,000 ton tanker called “The Towman.” The ship was searching an area of 1500 square miles. It was an oil tanker with an Indian crew, they were lovely people. 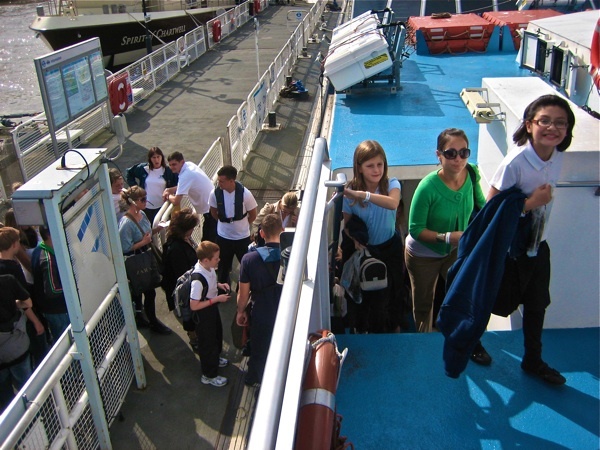 After ten days on the ship, we ended up in Gabon and were repatriated to Heathrow. I’d gone out in late November for training and come back again for Christmas. We were on standby waiting for the weather to clear, and then I got the call on Boxing Day and we set out a few days later in very early January. We didn’t break any records but we landed in Barbados after thirty-eight days, further South than we intended because of the weather conditions. I still haven’t been to Antigua. 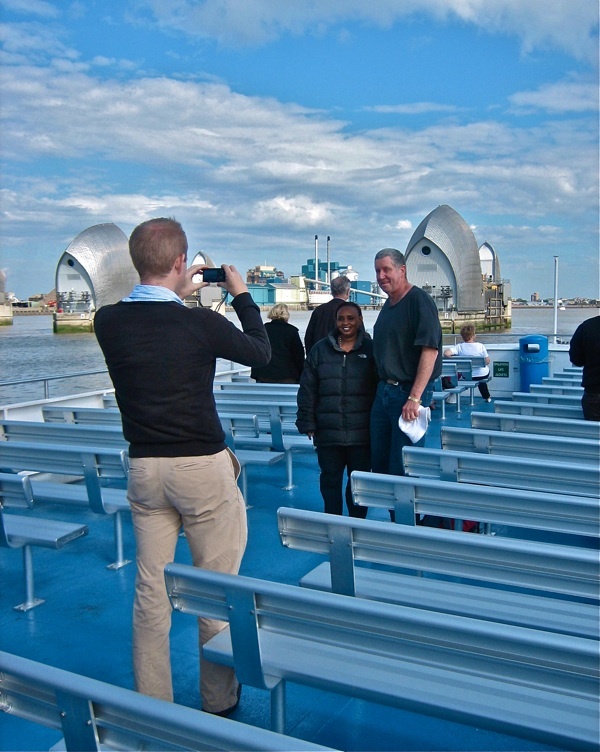 And then, even as I was still reeling from this account, Bobby shook hands and hopped off the boat at Tower Bridge leaving me in the company of his son Robert, the skipper of the ship, for the rest of the trip to the Thames Barrier. “So are you planning to row the Atlantic too?” I asked, wondering if this challenge might now become a rite of passage for successive Robert Prentices. “I wouldn’t discount the possibility,” he declared with relish as he stood with hands upon the wheel, his beady eyes twinkling excitedly at this enticing possibility. 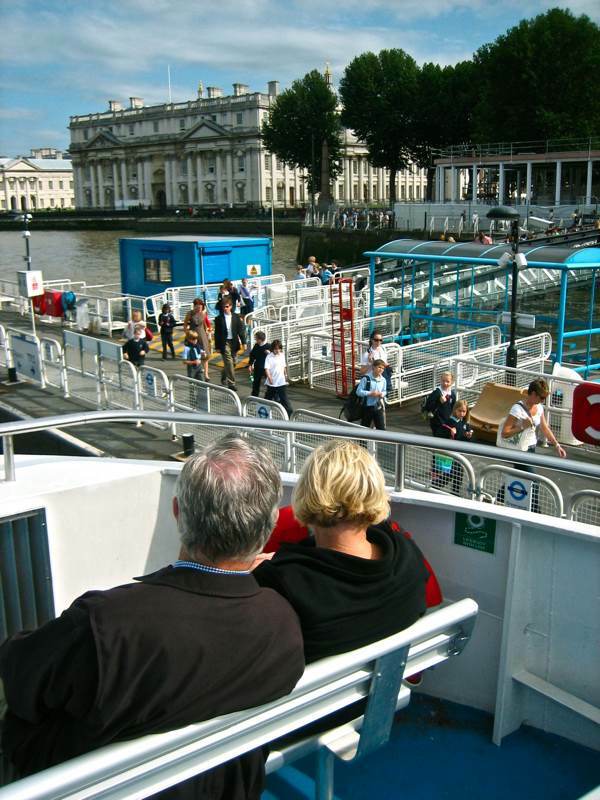 I sat beside Robert on the bridge and he spoke animatedly as we travelled on through Limehouse Reach, Greenwich Reach, Blackwall Reach, Bugsby’s Reach and Woolwich Reach. 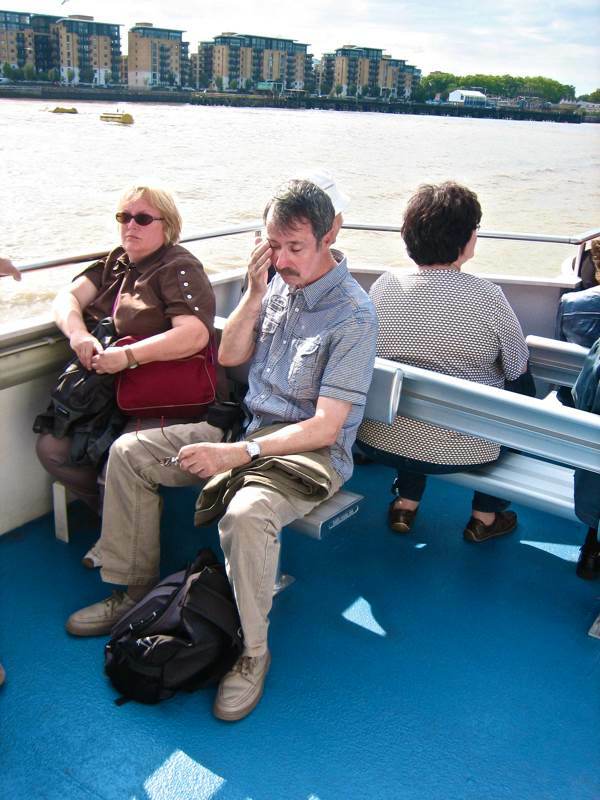 He told me about the porpoises, dolphins and hundreds of seals he sees on the river, and how the whale in Westminster was not the first on the Thames because he saw one at Purfleet. One Robert Prentice had disembarked, another Robert Prentice took his place at the wheel – the fourth and fifth Robert Prentices respectively – Watermen & Lightermen steering vessels through time as the mighty Thames flowed on. Robert Prentice, fifth generation Waterman & Lighterman. 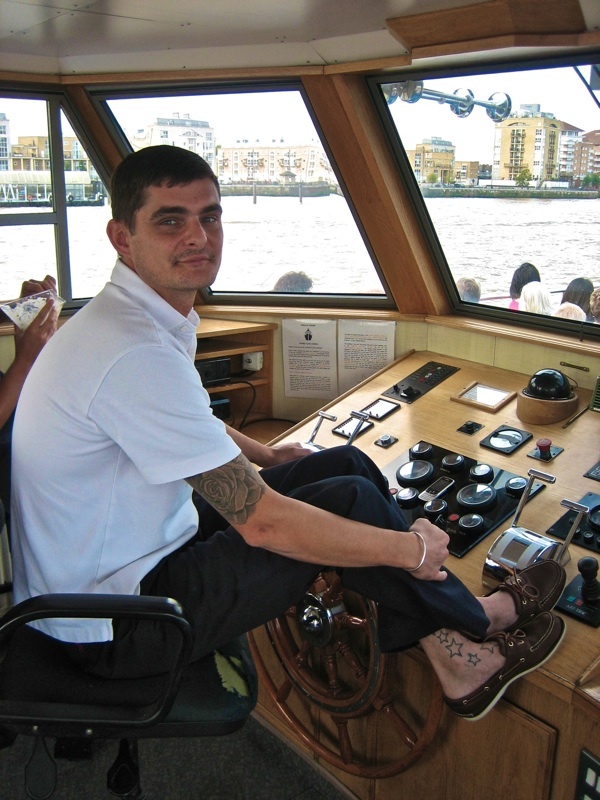 I hadn’t realised until the recent tragic death of Ben Woollacott, while working on the Woolwich Ferry, how tightly knit the world of the Thames is. It reminds me of the old days in the print and the docks where sons traditionally followed fathers into the same trade. I think that the photos in the local papers of 19 year old Mr Woollacott’s funeral, with Thames watermen carrying his red rose adorned white coffin, were among the most poignant I have seen. This is the liquid history of the river thames,!! Great pictures, and and excellent reading. Sally Kettle (see her on Facebook) should have been a “lighterman”, she has already rowed the Atlantic twice! I worked at Mercantile in the 60′s with Bobby & Brian Prentice, nice to see the line continuing. I remember an amusing incident during a National Rowing Squad training weekend at Henley on Thames, back around 1973/74. We all had to row a time trial, Bobby Prentice and Martin Spencer were in their double scull and I was close behind them as coxswain of a coxed pair. Halfway during the trial race they were slightly off course close to the riverbank. I could see them heading towards the overhanging branches of a large willow tree and was unable to warn them properly, without upsetting the balance of my own boat. They did not see my warning hand gestures and subsequently disappeared through the tree at full pace and out the other side, undeterred with leaves flying everywhere. I wonder if you have any imformation on my dad, he passed away and I would love to know about his time on the river, he talked about you a lot, my fathers name was John Holden. old Ted Hunt, stood out above them all. My father (Terry George) worked for mercantile lighterage & then Cory when they took it over. I remember him talking fondly of your family.